For the past five years, Iowa law has required citizens wanting a weapons permit to pay for a “safety” class that has no minimum standards. And, based on conversations with the crop of this year’s legislative candidates, no changes are on the horizon. In 2011, when Iowa became a “shall issue” state, removing nearly all discretion in weapons permitting from local law enforcement, the law required most applicants to attend safety classes. The Legislature, however, did not specify the content or curriculum of those classes or give such authority to the Iowa Department of Public Safety. The result is a patchwork — a range from comprehensive classes to those that provide no training at all. On the low end are online classes that consist of nothing more than videos, which don’t have to be watched, and multiple-choice quizzes. So long as a participant pays the class fee, which usually is about $50, he or she receives a certificate that meets the state requirements. There’s no need to fire a weapon — much less touch one. It’s an issue I’ve been writing about and bringing up directly with legislative candidates and lawmakers for years. So it should come as no surprise that when our Editorial Board sat down with Statehouse candidates as part of the endorsement process, I asked their thoughts. If the state is going to require training, should there be a public safety content threshold? Responses fell along party lines, with Democrats generally agreeing that basic curriculum or standards were needed and Republicans seeing no need. That alone, I think, is reason to pause. When did public safety become a partisan issue? Iowa Rep. Ken Rizer was perhaps one of the most talkative on the topic. He said he didn’t see the need for set standards, and he didn’t feel comfortable with further infringement on Second Amendment rights. I noted the safety class already is required as part of the permitting process, and that I didn’t understand how attaching standards to an existing requirement could be construed as further infringement. If the classes aren’t needed for public safety, if lawmakers don’t see a need for specific information to be a part of them, then the classes become nothing more than a permitting tax. “You’re comfortable with ending the training requirement?” I asked. He wasn’t. Another GOP incumbent, Senate Assistant Minority Leader Dan Zumbach, said there was no evidence the status quo wasn’t working — a sentiment echoed by other GOP candidates. Technically, that’s true. We don’t have statistics to compare the safety records of permit holders who attend comprehensive classes with those who effectively have no training. The records don’t exist because state and local law enforcement are strictly prohibited from gathering the information. We don’t know, for instance, if permit holders who have guns stolen from unlocked vehicles are more likely to have attended lackluster training. We can’t know what level of safety training permit holders involved in shootings, purposeful or accidental, have had. Law enforcement, which is tasked with issuing the permits, cannot tell the public what percentage of current permit holders are on the street with effectively no safety training. And, lest readers are tempted to believe these problems can be strewn solely at the feet of Republicans, it’s worth remembering that on the Democratic side of the aisle are a host of lawmakers who verbally agree on a need for training standards but otherwise have taken no action to make such changes a reality. It’s the reason Iowa gun owners, especially those who publicly display ineptness with their weapons, make me nervous. I’m not alone. When one of my previous columns on this subject was circulated throughout the country, I had the opportunity to speak with passionate gun owners from coast to coast. 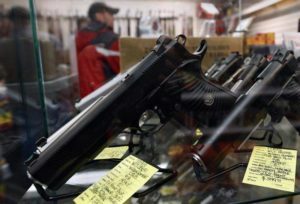 Time and again gun owners in states considered gun-friendly were taken aback by the lack of standards within Iowa’s mandate. Closer to home, I’ve spoken with Eastern Iowa gun store owners who offer comprehensive safety training courses and who are dismayed by the lack of standards. Just last week, our Editorial Board sat down with Linn County Sheriff Brian Gardner, who brought up the subject of safety training without prompting. As state law stands, he said, he has no way of determining the level of training an applicant possesses. “It’s possible that my office is accepting certification for online safety training that someone else actually completed. We have no way of knowing who the person was who answered the questions on the computer screen,” he said. The Iowa State Sheriffs’ and Deputies’ Association, like me, has brought such concerns to lawmakers for the past several years to no avail. To be clear, this isn’t about raising the bar on Iowa gun ownership and weapons permitting. What I and others are saying is that if the state is going to mandate safety training, it ought to mean something. The public deserves more than the false sense of security Iowa’s existing safety training requirement provides.